If you’re in Toronto you could find out the original address on Broadview and see what is built there now. If you aren’t in Toronto try Google Street View. Looks like it was replaced by a new school. It`s back in the trees on Street View so I`m not 100% sure. The imposing and grand architecture of the Queen Alexandria School on Broadview Avenue in Toronto is now gone from the landscape yet it is captured here on this vintage postcard for future generations. 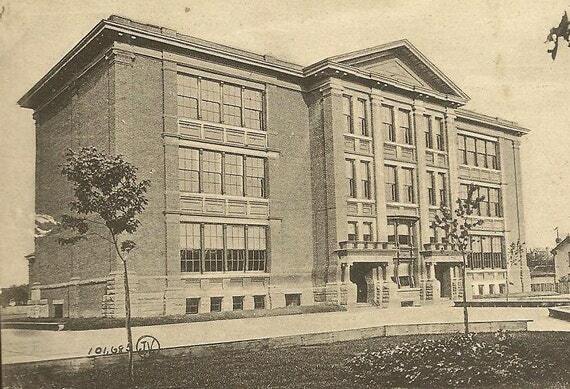 I believe the school was built around 1905 and demolished in the mid 1950s. The real challenge would be to see what (if anything) is left of the white house to the right in this colour postcard I found online. What could be found from the never built, demolished or cancelled road plans? I didn’t (so far) read why the roads were not built. For just the sake of transportation I think the Gardiner extension out to Scarborough would have been a great thing. A city the size of Toronto should have more than one main route from one end to the other. Now we have the 407, a toll road, but it does seem to be a faster way to get through the city when we have not planned to stop over anywhere in Toronto. As an explorer I like the road history. I notice the details on bridges especially yet I haven’t found a good time to pull over on the highway and get a few photographs. Roads change how a city is built too. Buildings are demolished to make way for new roads and buildings are built to make use of those new roads too. City planning seems basically about people moving to me. I’m sure there is more to it, like safety but in essence it seems to be about making the city work, transportation being a very big part of that. James Alcock is an urban planner and an expert researcher, specialized in analysing with objectivity the macro trends of the GTA transportation needs from all angles, and then coming up with a set of recommendations taking into account our motorists’ safety and the most efficient use of our existing infrastructure and budgetary resources. Born in the U.K., he moved to Canada with his family in 1969 and settled in Toronto, graduating from the University of Toronto in Urban Planning in 1983 ( Honours B.A.). James’ professional links with energy and transportation are very broad, which enable him a wide scope of analysis and a special ability to link various factors into a realistic proposal. As a matter of fact, he has held responsibilities linked to the Canadian car industry and market (through work on General Motors’ brands positioning, and surveying the burgeoning development of electric cars for a major manufacturer). He also contributed to the extension of Ontario Hydro power lines across the province. He even evaluated the availability of transportation and community services to a large portfolio of commercial properties managed by Merrill Lynch Real Estate. Most recently, he was a research and analysis specialist at the Canadian Automobile Association, where he performed research for five government affairs specialists to help determine motorist safety policies in conjunction with the Ontario Trucking association, involving media and political contacts, and liaising with officers of foreign sister institutions in the US, Australia, and the UK. James’s major achievement, on the Community involvement front, was the co-authoring, on his own personal time from 1990 to 1999, of ‘Get Toronto Moving’, the first ever citizen-designed transportation plan for the City of Toronto, produced as a contribution to solve the City’s growing gridlock problem, emphasizing a balance of new roads and transit with neighbourhood preservation. This plan was championed by the C.A.A. and won him the position of planning advisor to the Executive Committee of the Scarborough Residents’ Association. Bruce H. Bryer B.A., B.Ed. Born in North Bay, Ontario and educated as a teacher, Bruce H. Bryer is a veteran of the Toronto transit system, being employed by the Toronto Transit Commission for 25 years. He has cared about improving Toronto’s public transit system and has made many suggestions for the upgrading of the efficiency and safety of the system. Some of his ideas include innovative suicide prevention barriers at subway stations. He has also analyzed transit systems all over the world and made notes of the best that they can offer for Toronto. He is a strong advocate of smart card technology to ease and integrate public transit fare systems. Bruce is an advocate of balanced transportation, and he strongly supports completion of Toronto’s long-shelved Queen Street Subway in order to relieve downtown gridlock and to improve transit service to Toronto’s central business district. He is responsible for putting together the Public Transit section of the ‘Get Toronto Moving’ plan. Bill P. Lansing, President of the Citizen’s Transportation Alliance, was born in the heart of downtown Toronto. A university student and former professional driver, he takes great pride in his home city, and intends to improve upon it even further. He has travelled extensively throughout North America, and has always maintained an interest in urban freeway systems and rapid transit. Bill was instrumental in developing the freeway and rapid transit plans for “Vision 2030”, which is the long-term vision of ‘Get Toronto Moving’ as well as responsible for the creation of our corporate logo and byline. A firm supporter of economic and political growth and development, he is currently active in promoting the CTA mission and recruiting new members. Born in Toronto, Kevin is a civil engineer with many years experience with roads and traffic systems. He is a strong advocate of balanced transportation and has made detailed analyses of Toronto’s traffic problems. Travelling to Florida, he noticed the efficiency of the offshore bridge system, particularly in Tampa Bay. His idea was to adapt this system to Toronto. In 1990, he authored the proposal for the Gardiner Expressway Offshore Extension and the Humber Bayway. This was forwarded to Ontario Provincial officials and greeted with enthusiasm. He also put together proposals to eliminate the flooding problem in the lower Don River. From 1996 to 2000, Kevin was pivotal in fighting the demolition of the eastern Gardiner Expressway from the Don Valley Parkway to Leslie Street, which in time was proven to bring more traffic into his nearby neighbourhood, as he had predicted. Kevin also came up with the Scarborough Highlands Expressway proposal for the Gatineau Hydro Corridor and all of the arterial road missing links. He authored the roads section of the ‘Get Toronto Moving’ plan. He is currently employed with one of the largest engineering consulting firms in Canada. Eli lived in the North York area of Toronto and was married with three children. A member of the Toronto Bay Group, he was an advocate of revitalizing Toronto’s waterfront. He was involved in many studies on the future of the waterfront. Eli proposed the complete removal of the Toronto Island Airport and its conversion to parkland for the public to enjoy. He advocated the construction of a new waterfront airport further east off the Leslie Street spit. Eli was an outspoken opponent of demolition of the Gardiner Expressway and supported the Offshore Extension as proposed in ‘Get Toronto Moving’. He highlighted the importance of Toronto’s waterfront to the ‘Get Toronto Moving’ plan. Eli passed away in 1998 and is sadly missed by the other authors of this plan. Their existence may be very well hidden, but the former Metropolitan Toronto did have a network of numbered Metropolitan Roads! The only place I have seen them referred to, is updates to the Toronto by-laws. They are most certainly not posted, although they may be hidden within serial/reference numbers on pieces of infrastructure (light standards, signal control boxes, etc.). Toronto’s roads are referred to by the prefix “M.T.” — e.g., Yonge Street is “M.T. 29”. Like the Interstate system, all even numbers run east-west, and all odd numbers run north-south. Also similar to Interstates, numbers generally increase from west to east and from south to north, although there are many exceptions. Similar to Ontario’s 400-series highways, controlled-access M.T. roads start at M.T. 200; these numbers appear to also follow the even/odd E-W/N-S rule, although this theory would be better proved with the discovery of a number for Allen Road (formerly the Spadina Expressway). As I have yet to see an actual list of route numbers, the following lists may not include all number designations. It does, however, include all Metropolitan Roads referred to in the past four years of by-law amendments (1998-2001). Note: The above content is copied (and screen capture) from a site which has been abandoned but is still findable with the Wayback Machine archives. So far, I could not find the name of the original site owner. Found in a Tumblr blog which looks forgotten. I really liked this photo, so reposting to save it from eventual 404. Two men arrested for a taking a stroll in the sewers on Sunday shine a light on the world of urban exploration. Source: Two men arrested for late night foray into sewers | Toronto Star – By: Katie Daubs and Dale Anne Freed Staff Reporters, Published on Wed Apr 07 2010. If it works, this is the map I’ve made for places I am going to try to see while I am in Toronto this week. Far too many for just 3 days. Will see how far I can get. There are several I especially want to see.